Gonzalo Higuain has set his sights on helping Napoli depose Juventus and lift the Serie A title in his first season at the club. Following his big-money move from Real Madrid last month, the 25-year-old is tasked with replacing the departing Edinson Cavani as the Naples club's main goal threat. But he is confident of filling the prolific Uruguayan's boots, and wants to help his new team go one better than their second-placed finish in the Italian top flight last term. "We want to fight for everything, we have a great team and a great manager. We know that Juventus are favourites for the Scudetto but we can achieve this objective," he said. 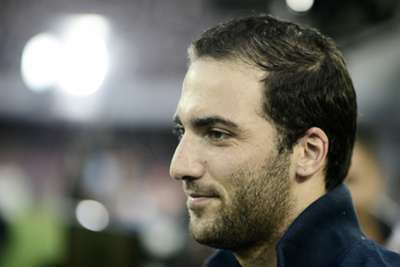 Higuain also cited the legacy of fellow Argentinian Diego Maradona as one of his reasons for wanting to join up with the Stadio San Paolo outfit. "In this city the devotion to Maradona is huge, I have felt the affection of the fans since my arrival. I chose Naples together with my family because I like the challenge and I find it inspiring," he added. "The president (Aurelio De Laurentiis) and (Rafael) Benitez took very little time to convince me, I spoke with my Argentine friends who have been to Naples and they told me beautiful things about the city and fans. "San Paolo is a mythical stadium, I'm happy and proud to be part of this team."